On the wall today, the same blocks as last time. This project has another block ready to sew together. These blocks from 5" squares are all together now (old picture)….just waiting for some black to be cut for the spacing. The Juki TL98E needs a tune up. Just waiting 10 more minutes until the store opens. I love this machine. It has an phenomenal stitch. Both piecing and free motion quilting is a dream. The Brother Embroidery machine is dusted off and ready to work. Did some test samples last night. If the Juki is slow to return…something will still get done. Here is what will get done. My goal this month was to finish something. The half square triangles in this project were a leader and ender project 2 years ago. The body of the quilt was put together just before a class for a similar quilt. Borders were added and it was layered in December. I thought that the brown thread would highlight the stars well, then changed my mind--what is your opinion? I have to rip no matter what. How does this flowery star come about you ask? A few years back a quilting buddy wouldn't let me borrow her template. Now I know why, she wasn't willing to part with it at all. It is hard to find on line. Here, the arc center was positioned and traced to the edge, then a nice wiggly line returns the quilt line back to the center. Repeat. My motto—look hard not be hard! DH found me my own on the internet. This template is versatile by allowing you to pick the appropriate curve and make mirror image curves just to name a few. This is the template used to achieve the Dahlia quilting found here. Now stop over to Patchwork Times and check out more design boards. This was the year we updated the master bathroom. We have been in this house for over 15 years. Some of the master bath towels…have seen better days. New towels appeared under the Christmas tree. The bath deco went from a celery green to dark brown. The curtains were the last thing. Our house is located in the sticks, boondocks, end of the road-literally. We have only 2 families that drive past our house and with a beautiful lake and park like yard, why cover up the view, so coverings are minimal. Our curtains in the bathroom were made from 2 layers of green sheer crinkle fabric and is edged with sheer green ribbon folded in half held up with shower curtain tension rods. This worked great. The ribbon looks like a design element and made finishing the edge of the thin slippery crinkly fabric so easy and the shower rods were thicker than ordinary small ones. This is a small rod for a very small window. Since Christmas, any trips to the store include looking for curtains to accent the new towels. Trips included Penneys, Younkers, Hancock Fabrics and various other stores. If I could find thin bottom tier drapes in the appropriate color-heaven! Finally found some fabric that would work. Took the picture and discussed with DH if he wanted FLOWERS all over his bathroom….yep! Off with a coupon and ready to commit to making them. Just after opening at Hancock’s had a discussion w/clerk. With coupon, down to $10/yd. That still is $60 for 2 panels. Looked all around the store for something else, I had already done that the day I took the pictures. It was time to move on. Time to try Hobby Lobby, swap states (cross the Mississippi and you are in a new state)and back to curtains. Found a panel on clearance at Hobby Lobby. The panel will no longer fit in the bag…$2.16. The panel is also available at full price..$11.99. These are way too thin for my purpose but thinking of all the browns in my stash, decided I could work with them. Ripping out the rod pocket & cutting the panel in half then just sewed it to the original curtains. The green shows through and looks great. They are the proper weight. The girls like them…DH had to be reminded to look, men. These 2 windows are out of the $2.16. Now to cut into the $11.99 panel for the small window. The Amaryllis is lovely. There is a second bloom getting ready to open. Lois, one of the Project Now Ladies gave these to all of her drivers. Volunteering is great. On another note, one of the shelter dogs I walked on Monday found a home! Time to pull out a project. Quilting on a UFO! My guild, Mississippi Valley Quilt Guild is home to Pat Speth author of “Nickel Quilt” books. Our guild has been trading 5” squares for over a decade. Pat created a whole genre around the 5” square and “coined” the phrase Nickel Quilts. She published some of the first patterns specifically for 5” squares. Last month the guild called and asked me to chair this committee for the next year. As the chair, one gets to choose the timing, color, size and amounts of each trade. Some suggestions were made and the first set of fabrics will be due in March. We are starting with neutrals. Here is the first suggestion of what to do with our 5” squares. This only requires the “Recs Tool” from the Tri-Recs tool set. This unit is a one cut design and goes together sooo fast. How does this go together so fast you ask….watch this. Pick 2 contrasting fabrics, mine are a Tonga Batik 5” pack my DH brought back from a business trip. My cutting comfort level ends at 6 layers. Layer 6 fabrics all facing up alternating background (black) and print (batik). Lay the Tri-recs tool on the square, mine is with the corner of the ruler meeting in the corner of my square (the fabric really is a square-poor photography). I varied how this ruler was lined up so that a whimsical feel was achieved. This means not every unit is exactly alike. You can be precise and have every unit the same by always lining the ruler up the same way. The faster way…more whimsical…just go for it. It is important to keep each set (the 6 fabrics you just cut) separate. Each stack must be sewn back together with the adjacent part of the same cut stack. If you mix sets together, the size of the final unit will be different. Now shuffle the stack by taking the bottom fabric (black in my case) and moving it to the top. I stand on the left side of this picture to cut and pair up my pieces. So, now flip the top fabric on the right side of the stack onto the left side of the stack and when you do that the right sides of the fabric will be together. Set this pair aside. Continue until all fabrics are paired. The stacks will alternate whether you are flipping a black piece onto a color or a color onto a black piece. Did you get that….right onto left and because all the fabrics were right sides up….they will be right sides together. Line up the points so that they cross at 1/4” and sew. Now anyone who has worked with this ruler knows there is a trick. You can lay this ruler different ways. Some designs call for all one unit and others need mirror image units. I meant to make all 1 type of unit….made a mistake and flipped it. Ooops. The design possibilities from the mistake are better because of it. After I realized my mistake it was time to play with different layouts. Most of these call for equal numbers of the different units. Below are other layouts that call for both leaning up and leaning down units. Figure out how many you need for the layout you like and go for it. You will get a unit for each square you start with….40 colored and 40 background = 80 total units. These are the same squares above turned 90 degrees with some color organization and off set. These are only some of the possibilities. Below is an example where most units lean the same direction. To have to diagonal line go the same way…they need to lean the same way. You can see that mine take a corner and go back the other way….I ran out of units leaning the same way. Both sets of units are needed if you want your line to zig and zag. Notice to get more background between the green and peach stripe a few black rectangles were used. Pay attention to the ruler. Be consistent if the units need to lean the same way. i.e. Ruler right side up & cut from bottom left to top right every single time. These units are not square. Mine measure 4 3/8” x 5”. You can trim them if you want or just ensure that the short sides all fall the same direction. The layouts shown utilize the rectangle unit so the short sides all line up. To get it done fast why make it smaller and spend your time trimming. Figure out how many of each unit (leaning up or leaning down) you need to make your layout. If you need equal number of units just keep alternating units while cutting until you get close to the end. Now, quilter Vicki Welsh w/ Field Trips in Fiber is where I found my inspiration…this link will take you to quilts with similar units. These units look square, where mine are not unless you cut them down. I can’t believe that it is 2014! After finishing Quilter’s Scrapbook, a previously put away project came back out. This has been a leader and ender project during 2013. I enjoy pulling out fabric, making a mess of the stash and sewing these blocks up. They go together so fast. This will stay on the sewing wall for awhile. About 1 week after finishing Quilter’s Scrapbook my guild called. They were in need of a chair for our 5” square exchange. Newly retired, I said yes. If you are in charge, you get to pick the swap details, right. It was suggested to help with interest to show uses for the 5” squares. Here is my first try. The blacks have been in my stash for awhile & the batiks DH found on a business trip. Gotta love a hubby that has great taste in fabric. There is enough fabric to finish the current row & end with a row of 2 of the top blocks. A tutorial will be coming, I snapped pics yesterday. The design layouts with this block are great. It has at least all the flexibility of the log cabin block. Hope you are warm…we are in the deep freeze. Lola went back to school a day early to avoid driving through the 12”, yes 1 foot, of snow expected at college. We ended up with at least 6”. MJJR now has her driving permit. DH & her went out yesterday to practice in the snow. Stop over to Judy L.'s to look at more design walls. Last year I set 12 projects that I wanted to complete for 2013. Completed- February 2013. Rock Candy Turning Twenty—Sent to a long arm quilter. Here as a family quilt. DH picked out the pattern & fabric on a business trip. Completed-May 2013. Batik Brown Quilt—Given to nephew for HS Graduation. Completed- August 2013. Diamond Delight—Given to Lola for HS Graduation. Not worked on at all…Sister to Lodge Quilt—Hand quilting “Big Stitch”. Some of the quilting needs to be ripped out and re-adjusted so the quilting design can turn the outer border. This quilt will be moved to this 2014 Goals. Completed- Turquoise Stacked Coin w/ applique—This quilt has not found a home yet. It had a plan, but it fell through. Not worked on…Dahlia—This quilt needs to have applique sewn on and last border added. I want to add a border in the Ricky Timm’s Caveman style. It makes me nervous. This quilt will be moved to this 2014 Goals. Not worked on…Oriental Sticks & Bricks—This quilt needs to be quilted. The binding is made. This quilt will be moved to this 2014 Goals. Completed- Knitted Tank Top—This was completed in 2014 but only 3 days after the cut-off (finished it Friday). My first knitted top of any kind. Not worked on…Round Robin Quilt—This quilt just needs the applique done and binding put on. This is very close to being done. Getting all that appliqued placed just so….scary. This quilt will be moved to this 2014 Goals. 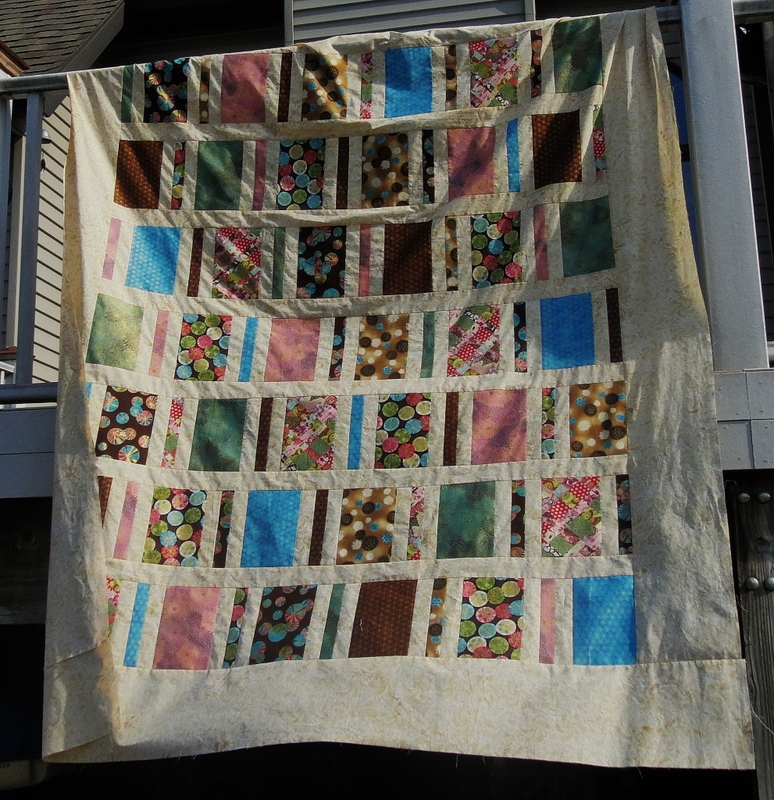 Not worked on…Grandmother’s Plates—This quilt was deconstructed and needs to be appliqued onto new muslin. This handwork was not started due to the tank top taking so long. Worked on but not completed…Bonnie Hunter Red, White & Blue Quilt as you go—This was worked on but not much. This was put aside to work on “Quilter’s Scrapbook”. This other quilt had a deadline. This quilt will be moved to this 2014 Goals. These were the goals…not too bad…finished 6 total. I see of trend of applique procrastination. But we all know that other things get in the way ,too. So here are the projects added to the list. Quilter’s Scrapbook—Top Done. This is a new pattern I was lucky enough to test. Quilting of this project this quilt will be moved to this 2014 Goals. Brown Stars—Top Done & layered. This was a sample piece that was put together for a class. Christmas Traditions Quilt—Quilted and silent auctioned in December. This was made by several people. Purple Batik Jelly Roll Race—This quilt is for a Co-workers benefit, a friend did the piecing & binding. I did the quilting. The Europe trip, College Move in and Quilt show all happened in about 2 months. This was why my blog was quiet. Other big change…Unemployment. After 7 different medical lab sites (4 different hospital systems) & 23 years making life altering decisions for people….I left the medical field. I still haven’t decided what I am going to do…I am enjoying the time off. Only 1 day did I think….Man isn’t it time to go to work. Next post, Goals for 2014. The camera needs to come out first.